In April 2016, Maria Penrose presented the idea of a research project highlighting trauma registrar education in Ohio to the AOTR membership. A conference call was held for interested AOTR participants to discuss the project potential. 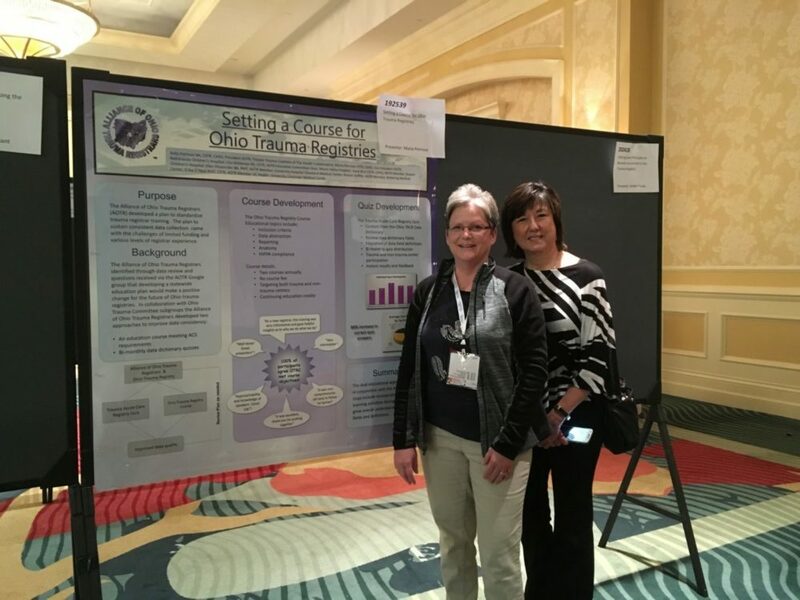 The goal was to show improvement in Ohio registrar’s education through the Trauma Acute Care Registry (TACR) quizzes and the Ohio Trauma Registry Course (OTRC). It was suggested that an abstract and poster be submitted to the Trauma Quality Improvement Program (TQIP) for presentation at the Florida meeting, November 3-7, 2017, showing results from the TACR quizzes and pre/post tests from the OTRC. The participants worked on the project and sought outside input from researchers and abstract reviewers to fine tune the presentation. Positive comments and constructive suggestions were provided and changes were made. The abstract and poster were then presented to the AOTR group for approval and submitted to the TQIP organization for the November conference. Maria notified the AOTR at the October 2016 meeting that the abstract and poster were accepted by TQIP for inclusion in the 2017 conference. The poster and abstract were well-received at the TQIP conference which had over 1600 participants. Many people from multiple states stopped and spoke with the AOTR workgroup participants regarding the poster and abstract. Their questions included: how do we start a group like this in our state? How many members do you have? How did you come up with this project (OTRC)? How is the course being received? How often are TACR quizzes sent out? Kathy Jenkins Cookman was given a big THANK-YOU as the founder of the AOTR organization. Without her vision and determination, the AOTR would not have grown to its current status and would not have been at the TQIP conference presenting this abstract and poster. Thanks was given to Maria for presenting this idea and being the project leader. The AOTR workgroup hope to update the project as more data becomes available.